It’s the details that make up the beautifully-manufactured Tiffin Allegro Bus – the handcrafted hardwood cabinetry, the chef-friendly induction cooktop, the luxurious and spacious master suite. Pairing practicality with comfort, you will find the most efficient design elements utilized in the exterior and interior. 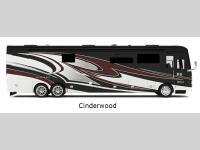 7′ tall ceilings will make you forget you’re in a motorhome in the first place, but Tiffins’ superior PowerGlide chassis and Ultra Leather seats with eight-way power adjustments will remind you in the best way. 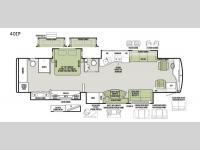 Featuring an abundance of storage capabilities (including a basement with up to 177′ of cubic storage!) 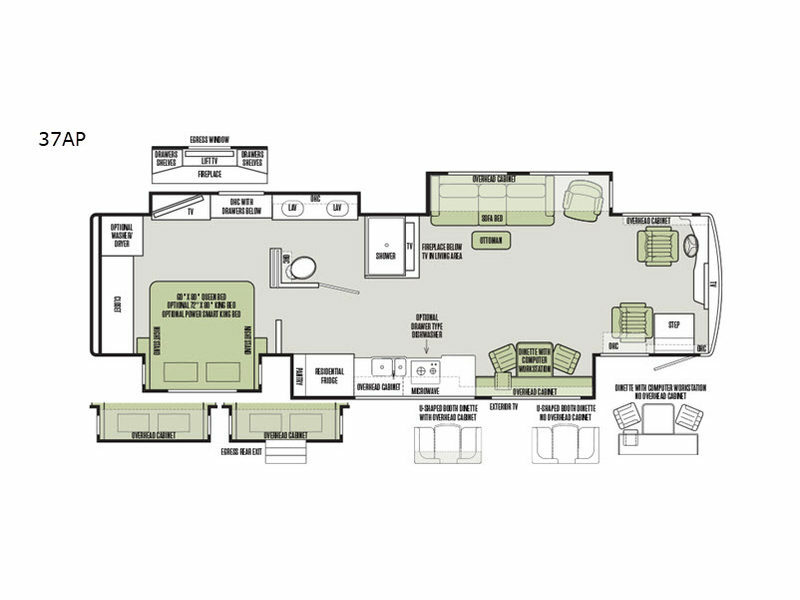 and customizable floor plans, the Tiffin Allegro Bus can be customized to fit your idea of the perfect motorhome. You won’t find a better road partner than the Tiffin Allegro Bus – whether in drivability or comfort. Tiffin prides itself on the handcrafted artistry that produces some of the most beautiful and durable features within the Tiffin Allegro Bus. 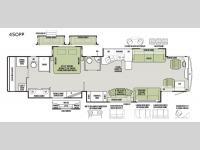 The hand-laid porcelain tile floor, individually-crafted wardrobes and cabinetry, and other customized touches make this RV model perfect for those who want the best in the industry. You’ll feel right at home with the galley’s impressive array of features, such as the stainless steel dual-door refrigerator, beautifully-designed backsplash, and digital induction cooktop. The customizable options don’t end there – make the master suite your personal paradise with an array of memory-foam mattresses to choose from to fit your sleeping needs. Indulge in luxury with heated porcelain tile that will give you a wonderful way to wake up on those chilly mornings. Grid-locked porcelain tile flooring ensures a beautiful interior design alongside stability, and it is installed in one piece to ensure that your floor is leak-proof. Air conditioning runoff moisture is directed away from the entry door to ensure the safety of all passengers. Whether you decide to bring it all with you, or leave it all behind, the Tiffin Allegro Bus can accommodate your storage needs, and is sure to surpass any competitor’s equivalent model. LED lighting illuminates the interior without draining the battery life of your coach – you’ll definitely notice the difference over traditional incandescent bulbs. Create your perfect haven away from the elements with the virtually silent climate control system that evenly distributes crisp air throughout the entirety of your coach. Our airtight and watertight slideouts are unique in that they are built as single fiberglass units, and our SmartSlides are also undetectable when not in use. The ultimate protection against leaks, our single-paned fiberglass roof is the most solid barrier in the industry. If it’s made of wood, it was handcrafted. 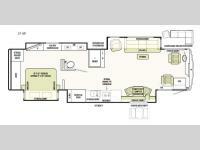 Custom-built wardrobes, cabinetry, and other amenities all have individualized attention given to each detail.